Passing Through The Eye Of The Storm Together. Foreword: Yesterday, August 23, was the 10-year anniversary of #HurricaneKatrina. There have been many stories written about the devastation, survival and hope. We featured one of those stories, about Nikki Moon and her little Scottie, Madeline in The New Barker #dogmagazine. Written by Luellen Hoffman, it appeared, as written below, in the winter, 2010 issue of the magazine, five years after the storm. It is still one of our favorites. Special thanks to Luellen for bringing us this story. Special thanks to Nikki for sharing your story of strength. You help us remember to count our blessings. It was one of those rare moments, captured by CNN. Millions of people saw it playing out dramatically on television, watching live coverage of Hurricane Katrina as it smashed into the Gulf Coast and countless victims fought to survive the flood waters. Many of the locals (as we saw on television) had decided to wait it out. One of those waiting for the storm to pass was Nikki Nicholson, her dog Madeline, and several of her friends and neighbors. 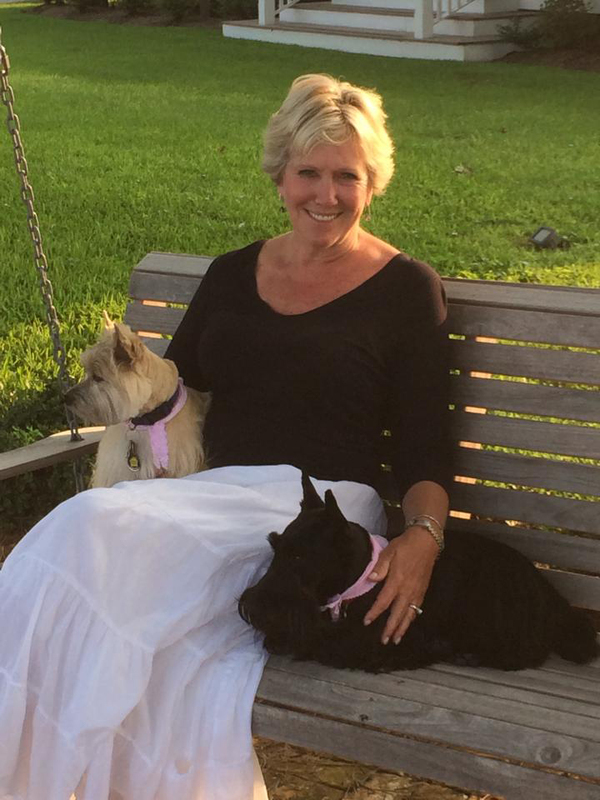 In 2005, Nikki, an attractive fun-loving woman, left the convention industry in New Orleans and moved to Bay St. Louis, Mississippi with her eight-year-old Scottish Terrier Madeline. She had always dreamed of buying a large Southern home to run as a bed and breakfast and The Bay Town Inn, a historic home built in 1899, was the perfect fit. A grand home converted to an Inn during 1993, it had weathered many storms over the years, from 1965’s category four Hurricane Betsy, to Camille, the infamous category five hurricane whose 190 mph winds wreaked havoc on Aug 17, 1969. The Bay Town Inn stood strong throughout, suffering no damage. With this history on her side, Nikki felt certain she could safely ride out any storm nature threw at her. People from all over the country frequented the popular Bay Town Inn, and Madeline (Maddy to her friends) was always the first to greet guests at the front door. “The guests loved her, many claiming they returned just to see Maddy,” Nikki explained. Life was good for Nikki and her little black dog. But all that was about to change. Even though Nikki felt her B&B could withstand almost any storm, she says it became very clear, very quickly, that Katrina was more powerful than anything anyone had ever seen before. When it hit at 9:15 a.m., a rush of water…a huge 40-foot storm surge, tore her house apart. Nikki, Maddy and her friends, Doug Niolet and Kevin Guillory, ended up outside on the street. To find refuge from the violent wind and raging waters, Nikki and her two friends grabbed onto the only stable thing available—a tree. She watched helplessly as her home was completely destroyed, the roof ripped off and blown down the street. Unbeknownst to Nikki, she was live on CNN, the whole world watching her dangling in the air from a skinny oak tree, grasping her dog in one arm and two friends hanging onto the same tree, as the flood waters rushed below them. At first Nikki had tried to put Maddy in a plastic carry-all bag, but her pooch would have nothing of that. So she climbed the tree and one of her friends handed Maddy up to her. And there they hung, like human Christmas ornaments watching, along with the rest of the world, as the storm raged all around them. With little Maddy tucked up under one arm and pressed up against Nikki’s body, they dangled in the oak tree for four long, frightening hours. The Angel Tree. 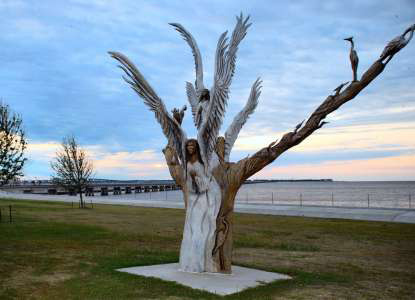 Nikki and her friends commissioned an artist to carve an angel into the tree that saved their lives. At 1:30 that Monday afternoon, the waters started to recede and one of the friends jumped into the three-foot deep murky water. One by one, they all jumped down from the tree and sloshed their way through the water and mud to reach a house across the street. The first floor was gone, but a still-intact stairway took them to what was left of the second floor, where they collapsed onto two beds. A nice older couple had lived there, wisely leaving before the storm. After a short rest, the three friends borrowed some of the couples’ dry clothes and walked three blocks to a friend’s empty, but mostly undamaged house. Finding the spare key, they let themselves in and finally felt dry and safe. Exhausted, but sheltered from the storm. Though it has been five years since Katrina, it is still difficult for Nikki to speak about her traumatic experience without tearing up. She said her brother was in London during the storm and saw her on CNN, as did her father who lives in St. Louis. They were both relieved to know she was alive because at that time, and for many days thereafter, there were no means of communication available to let her family know she was okay. CNN cameras had captured Nikki and her dog clinging to life on that tree. CNN reporter Gary Tuckman wanted a follow-up interview. Tuckman had been raised with Scotties and wanted to see how Maddy was doing. When CNN ran the clip about Maddy, it caught the attention of Scottie lovers everywhere. Much to her surprise, that following Christmas Season, Nikki received many personal notes from Scottie owners all across the country. Maddy’s notoriety on television lead to an invitation from The Scottish Terrier Club of Greater Atlanta to visit Warm Springs, Georgia (home of Franklin D. Roosevelt) as special guests of the 2006 Scottish Terrier Convention. President Roosevelt’s fondness for his Scottish Terriers was renowned. Nikki started to work full time again in April 2006 and it was around this time she began dating local business owner, John Moon. John had never seen Nikki before the storm, or on television during it. He had evacuated the city before Katrina hit, moved to St. Pete Beach, and was working with the American Red Cross in Tampa Bay to help others who were fleeing the carnage. One day while walking the white sand beach, he happened upon The Don CeSar Beach Resort and its Mediterranean beauty captivated him. Later, after he met Nikki, he took her there during Easter break in 2007 to share it with her. Nikki thought the beach and hotel were wonderful, and it was during this time that she fell in love with John. They decided to get married there, doing just that on November 20, 2010. As Nikki states with a romantic tone of happiness, “it just made sense to get married where we fell in love.” Today I guess you could say that after the storm, life presented them with a silver lining. “I found love and Maddy did too”. Nikki says with a smile, referring to John’s dog, a sandy colored cocker spaniel named Duke, who is 14 years old and a close companion to the now 13 year-old Maddy. 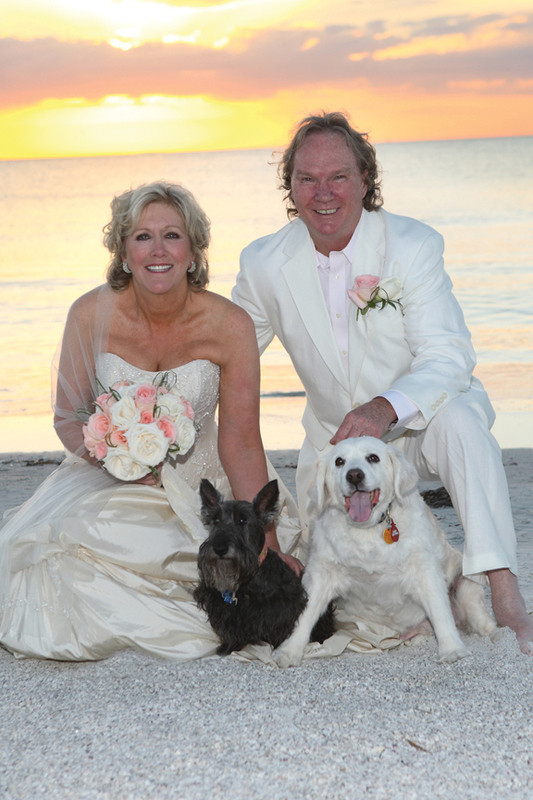 Both dogs were in the wedding party and walked down the aisle with the bride and groom. Over the past five years, we have witnessed the courage and resolve of those who came through Katrina and rebuilt a new life. Nikki is one of those people and so is her dog Maddy. Nikki, and the puppy she loved more than life itself – passed through the eye of the storm together. Over the Moon. Wedding at the Don Cesar with their dogs in attendance. Afterword: Nikki and John moved forward to rebuild Bay Town Inn Bed and Breakfast with sweat equity, grant money, love, and determination. Sadly, John passed away in June, 2012. The completely renovated Inn re-opened in September, 2013. Today: Nikki and Miley, her Cairn Terrier and Stella. Both dogs greet guests at the Inn. 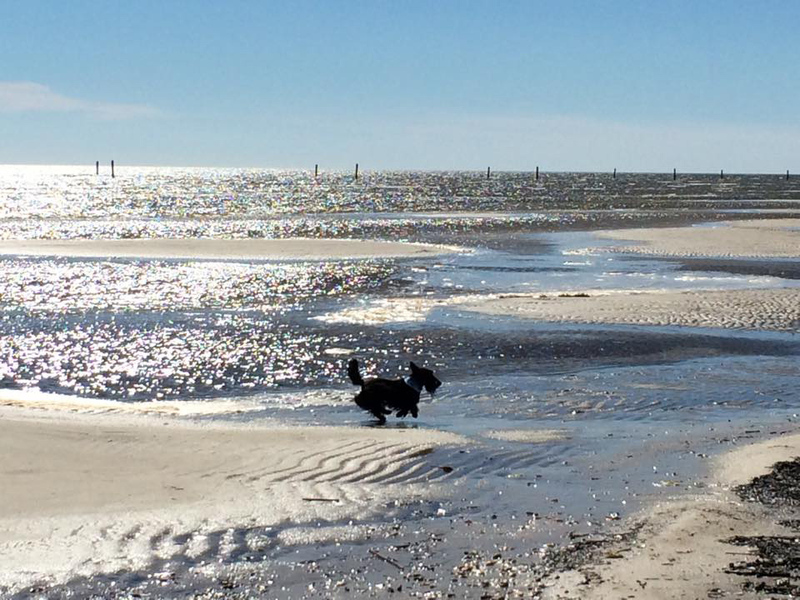 Bay Town Inn is dog friendly. We look forward to visiting you soon, Nikki, Miley and Stella. Previous Previous post: And They Call It Puppy Love. Next Next post: Catch A Wave & You’re Sitting On Top Of The World.